Aston Martin Racing BMS Scuderia Italia has lined up three of its FIA GT stars for its Le Mans entry, the #69 DBR9. It will be raced by Fabio Babini, Fabrizio Gollin and Christian Pescatori. Gollin and Babini are racing together in the FIA GT Championship this year, while Pescatori drives the other DBR9 in that series. ’The choice, in agreement with Pirelli, the main partner of BMS, is for three professional drivers’, says the team’s statement. The car will race with an orange ‘mouth’ - as seen at Silverstone (below). AMR BMS Scuderia Italia will head from Brno directly to Le Mans, for the test day on June 4. That’s the driver line-ups in GT1 just about complete – with the exception, oddly, of the drivers in the two factory DBR9s. 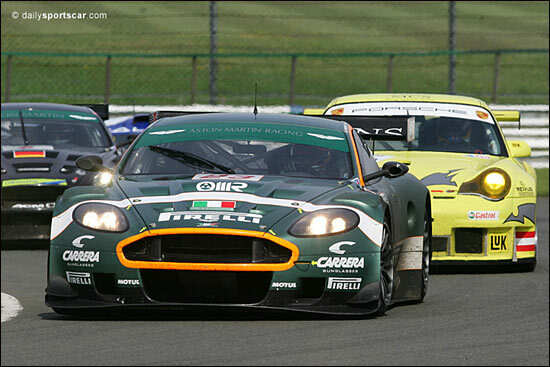 There is a lot of talent among the drivers in the 12 GT1 entries.